In early 1993, Ausrapid approached Australian Indoor Cricket Federation (AICF) and a National event for players with an intellectual disability ensued. A meeting was held with Keith Lewis, Lord's Taverners Australia and the event became the Lord'sTaverners Shield in 1994. AICF was the first Australian Sporting Organisation to really embrace the concept of inclusion and include an event for people with an intellectual disability alongside their National Open event. With the unwavering and generous financial support of The Lord's Taverners Australia and branches, The Lord's Taverners Shield has just celebrated it's 22nd year and the contribution has exceeded $500,000. Over the course of the Lord's Taverners Shield this sponsorship has helped the lives of 320 men and 6 women with an intellectual disability. The Inas International Cricket Series showcased the high standard of international cricket for players with an intellectual disability. England won the series 5-1 and dominated the tournament from the outset. There were several standout performances for the English team with Captain Chris Edwards winning the Player of the Series making 272 runs at an average of 90.7 including a magnificent 104 in the final game at Carlton Cricket Club. Chris also took 7 wickets at 10.4 during the tournament which demonstrated his capabilities as a genuine allrounder. Other highlights included an incredible innings of 115 off 64 balls from Dan Bowser in game two (back home, Dan plays Minor Counties for Devon and has played 2nd XI for Leicestershire and Somerset County Cricket Clubs) and a deadly spell of bowling from fast bowler Matt Cowdery who took 7/19 in game four. The Australian’s were very well led by Captain Gavan Hicks and well managed by Head Coach and former international cricketer David Hemp, assistant coach John Lonergan and Team Manager Jo Connolly. The find of the tournament was young Australian player Boyd Duffield who took 9 wickets (equal second for the tournament) and made some handy runs. Gavan Hicks produced the highlight of the tournament for the Australians with a very well compiled 94 runs in the final match. The Blind Cricket Division was a hotly contested tournament played on the magnificent facilities at Caulfield Grammar School, which produced some incredible individual and team performances. South Australia defeated Queensland in the final to clinch their first ever National Championships. South Australian 20 year old all-rounder Stephen Palmer was a standout performer amassing 230 runs in five innings at an average of 76.7 and taking 7 wickets at an average of 15.1. Incredibly Stephen was also Australia’s wicket-keeper at the recent Blind Cricket World Cup played in Cape Town late last year. Stephen tied with Victorian David Gauci for the B3 Player of the Series. The B2 Player of the series was also a tie between Queensland and Australian all-rounder Lindsay Heaven and NSW Captain Scott McDonald. The B1 Player of the Series was awarded to ACT all-rounder Cameron Roles. Following the inaugural All Abilities Championships and consistent with the National All Abilities Cricket Strategy, we are looking forward to hosting this event on an annual basis with three National Divisions from 2016: Blind Divison, Deaf Division and Intellectual Disability Division. The timing of the event and the host state and region will be determined in close consultation with all key stakeholders. The legacy that all your efforts will leave is something that you will continue to be proud of in years to come. This is just the start of a journey that is only going to get bigger and better and I hope that you will continue on this journey with us and help us to increase opportunities for all cricketers with a disability. The Lord’s Taverners in Victoria embrace a strong belief that individual and personal development is enhanced by promoting social interaction and companionship through active participation in sport. This annual event sponsored by The Lord’s Taverners is testimony to this by attracting local, interstate and international competitors allowing them to showcase their exceptional talents in front of significant crowds during the world’s best Grand Slam tournament, the Australian Open Tennis Tournament at Melbourne Park. The partnership between Tennis Australia, AUSRAPID and The Lord’s Taverners is very strong and continues to create opportunities and provide an avenue for sensational tennis. Importantly, it is a time where goodwill amongst competitors, organisers and spectators alike is promoted and friendships renewed. This month we celebrate 18 years of sponsorship, which we are proud to have done since its inception. With the buzz of the Cricket World Cup taking place at the moment, this is a great opportunity to focus on another significant International Cricket Series taking place in Melbourne during March. The INAS International Cricket Series - 2015 World Cup is an inititive of Cricket Australia in consultation with Cricket Victoria, The Lord's Taverners Australia and Ausrapid. The INAS Tri Nations Cricket Series was first conducted in South Africa in 2005 between Australia, England and South Africa, with these three nations initiating an international pathway for elite cricketers with an intellectual disability. The tournament will took place from the 16th of March and conclude on the 24th of March and was held at various venues across Melbourne. John Watkin at Cricket Victoria recently advised us that the “All Abilities Cricket” Carnival conducted at Casey Fields, now sponsored by the Lord’s Taverners, has received the Disability Sport and Recreation ‘Initiative of the Year’ Award. officials or administrators regardless of the socio economic, gender or cultural background. The Award recognizes the outstanding achievements and innovative contributions to health promotion in Victoria through Vic Health funded projects. 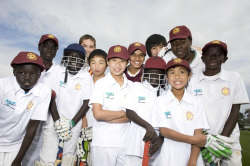 Community Sport and Recreation Awards – Lucknow Cricket Club were recognized for their development program with the Indigenous community in Bairnsdale. These awards are due recognition for the dedication and commitment the team at Cricket Victoria are doing in promoting the “Harmony in Cricket” program across all levels of cricket in the broader community. On behalf of all Lords’ Taverners in Victoria we congratulate John, Annie Hateley, Steph Newton and the team at Cricket Victoria on a tremendous achievement. Following the 2011 event he was ranked in the top four and as such was eligible to be selected by Tennis Australia for the Global Games Tennis team. The selection criteria stipulates that an athlete must meet the playing standards but also be able to travel independently. Senya’s parents, Boris and Natasha approached AUSRAPID and Tennis Australia and stated that if they could pay for their travel to support Senya could he be considered. The AUSRAPID Board met and decided that in this case, special consideration would be granted to allow Senya to be selected, even though it was outside standard guidelines. Boris and Natasha, paid for their trip and Senya’s participation. They alternated 12 hour shifts caring for Senya’s needs and his involvement on the team was fantastic. He has never travelled ever before as part of a team and you could see the daily growth in his skills. He ended up playing off in the Gold medal game against the top seeded Czech player. He won the silver in Singles and a silver in teams event and a bronze in doubles. Senya was a delight to have in the team and his progress just epitomizes what AUSRAPID represents. Once a person is treated with respect and given the opportunity to compete in sport where the focus is on ability, then the sky is the limit to what they can achieve. I was a very proud Australian on the day that Senya looked me in the eye and shook my hand. He just kept saying ‘Thank you, thank you, thank you’. Hi parents were extremely appreciative of the opportunity given to Senya, but I would have to say that the pleasure was all ours. His parents deserve a medal for the 23 years they have had to provide full time care for Senya. They deserve additional praise for seeing that playing sport, in this case tennis would assist Senya and his life skills.